On April 15, 1912, RMS Titanic, which was the largest ship afloat at the time she entered service, sank in the North Atlantic Ocean after colliding with an iceberg during her maiden voyage from Southampton to New York City. It was one of the deadliest commercial marine disasters in modern history: of the estimated 2,224 passengers and crew aboard, more than 1,500 died. Here is a real-time animation of the RMS Titanic’s sinking below, published by Titanic: Honor And Glory channel. This is a highly accurate full-length animation of the Titanic sinking, beginning with the iceberg collision and ending with its disappearance. The point of collision is at 1:06. This is a complete animation; not a short animation that was slowed down to match real time. The animation includes text frequently appearing with what is happening on board the ship. This includes visuals of various interior rooms flooding, lifeboats launching, rockets firing, and the Californian on the horizon. The animation was created by the creators of the upcoming video game “Titanic: Honor and Glory” using Unreal Engine 4. The exterior model used is not our final model, but an older model created by one of the team members. In April 1912, the ice conditions in the North Atlantic were the worst for any April in the previous 50 years. As a result, there were many drifting icebergs warning while the Titanic was crossing the ocean. During the April 14-15 night, although the air was clear, there was no moon, and with the sea so calm, there was nothing to give away the position of the nearby icebergs; had the sea been rougher, waves breaking against the icebergs would have made them more visible. Furthermore, the lookouts had no binoculars: the British merchant seaman David Blair (11 November 1874 – 10 January 1955) was originally appointed the Second Officer of the Titanic. The owner company of the ship, the White Star Line, however, decided that with the Titanic’s sister ship, the RMS Olympic, currently undergoing layovers, to have the Olympic’s Chief Officer, Henry Wilde take the position, citing his experience with ships of the Titanic’s class as a reason. When Blair left the Titanic on 9 April 1912 he took with him the key to the Crow’s nest locker (crow’s nest is a structure in the upper part of the main mast of a ship or a structure that is used as a lookout point), presumably by accident. This is believed to be a reason why there were no binoculars available with the crew during the voyage. But, in fact, binoculars would not have been effective in darkness which was total except for starlight and the ship’s own lights, as there was no moon in the sky. First Officer William Murdoch is generally believed to have given the order “Hard astarboard” which would result in the ship’s tiller being moved all the way to starboard (the right side of the ship – old English stēorbord ‘rudder side’, ‘steer board’, because early Teutonic sailing vessels were steered with a paddle over the right side) in an attempt to turn the ship to port (left). This “reversal” of directions was common in British ships of the era. Murdoch also ordered to set the engines into reverse. But it was a mistake: the center turbine could not be reversed, both it and the center propeller which positioned directly in front of the ship’s rudder, were stopped. This reduced the rudder’s effectiveness, therefore impairing the turning ability of the ship. Had Murdoch turned the ship while maintaining her forward speed, Titanic might have missed the iceberg. An underwater spur of iceberg scraped along the starboard side of the Titanic for about seven seconds; chunks of ice dislodged from upper parts of the berg fell onto her forward decks. The impact caused a huge opening in the ship’s hull. Above the waterline, there was little evidence of the collision. But, the opening was about 300 feet (91 m) in length. Calculations based on the observed flooding of the forward compartments suggested that the area of the hull opened to the sea was “somewhere about 12 square feet (1.1 m2)“. The ship began to flood immediately. The estimated rate of water pouring was 7 long tons (7.1 t) per second, which is fifteen times faster than it could be pumped out. The watertight bulkheads extended well above the water line, but they were not sealed at the top. Titanic was only designed to float with any two of sixteen compartments flooded, but she could remain afloat with certain combinations of three or even four compartments (the first four) open to the ocean. Unfortunately, with five compartments flooded, the tops of the bulkheads would be submerged and the ship would continue to flood. 62-year-old Captain Edward John Smith felt the collision in his cabin and immediately came to the bridge. Informed of the situation, he summoned Thomas Andrews, Titanic’s builder who observing the ship’s first passenger voyage. 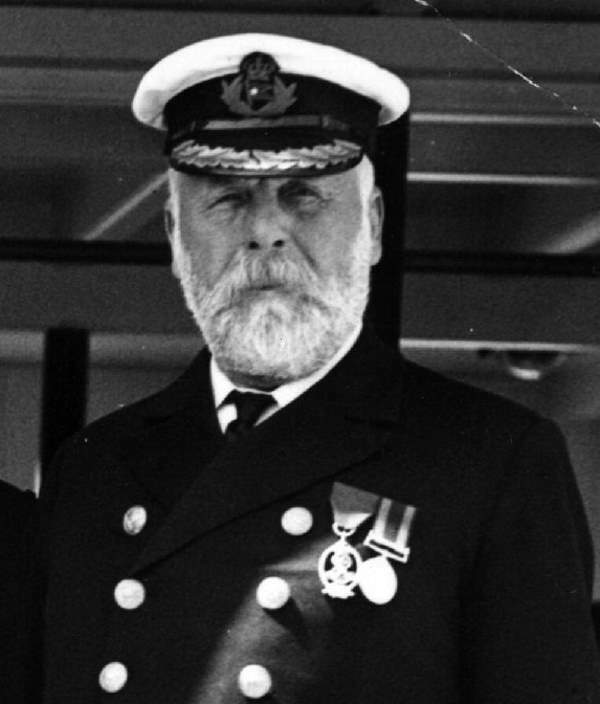 Andrews informed the captain that the first five compartments were flooded, and therefore Titanic was doomed. By his estimate, the ship would sink in about two hours. 0:07:45 (23:47) – Captain Smith orders engines to half-ahead. 0:16:52 (23:56) – All engines were ordered to stop. This is the last time her engines would function. 0:19:41 (23:58) – Titanic stops for the last time. After the engines stopped, the ship started drifting slowly to the south in the Labrador Current. Boiler pressure and excess steam are vented to prevent boilers from exploding in contact with the cold incoming sea. The stokers and firemen were waist-deep in freezing water by the time they finished their work. 0:21:00 (00:00) – It is now past midnight, Monday, April 15, 1912. Captain Smith ordered the ship’s lifeboats uncovered and the passengers mustered, and the crew summoned. Titanic’s lifeboat system was designed to ferry passengers to nearby rescue vessels, not to hold everyone on board simultaneously. It only carried enough lifeboats for 1,178 people, about half the number on board (there were estimated 2,224 passengers and crew aboard), and one-third of her total capacity. Therefore, with the ship sinking rapidly and help still hours away, there was no safe refuge for many of the passengers and crew. 0:27:14 (00:06) – The First Class Lounge is opened for passengers and is designated the assembly point for the start of the evacuation. 0:36:08 (00:15) – Jack Phillips and Harold Bride, the two wireless telegraph operators, are put on standby and told to prepare to call for help. 0:37:21 (00:16) – The orchestra has begun playing in the Lounge. 0:38:12 (00:17) – Titanic begins taking on a starboard list. CQD, not SOS, is the regulation call sent in the beginning. It was one of the first distress signals adopted for radio use. Land telegraphs had traditionally used “CQ” (“sécu”, from the French word sécurité) to identify alert or precautionary messages of interest to all stations along a telegraph line, and CQ had also been adopted as a “general call” for maritime radio use. However, in landline usage there was no general emergency signal, so the Marconi company added a “D” (“distress”) to CQ in order to create its distress call. Sending “D” was already used internationally to indicate an urgent message. Thus, “CQD” is understood by wireless operators to mean, “All stations: distress.” Contrary to popular belief, CQD does not stand for “Come Quick, Danger”, “Come Quickly: Distress”, “Come Quick – Drowning!”, or “C Q Danger” (“Seek You, Danger”); these are backronyms. CQD was never adopted as an international standard since it could be mistaken for a general call “CQ” if the reception were poor. At the second International Radiotelegraphic Convention, held in Berlin in 1906, Germany’s Notzeichen distress signal of three-dots/three-dashes/three-dots was adopted as the international Morse code distress signal. (This distress signal soon became known as “SOS” because if gaps are inserted it can be thought of as the Morse codes for those letters – by contrast, CQD is transmitted as three distinct letters with a short gap between each. It was SS Californian, which had warned Titanic of ice a few hours earlier. Apprehensive at his ship being caught in a large field of drift ice, Californian’s captain, Stanley Lord, had decided at about 22:00 to halt for the night and wait for daylight to find a way through the ice field. At 23:30, 10 minutes before Titanic hit the iceberg, Californian’s sole radio operator, Cyril Evans, shut his set down for the night and went to bed. On the bridge, her Third Officer, Charles Groves, saw a large vessel to starboard around 10 to 12 mi (16 to 19 km) away. It made a sudden turn to port and stopped. If the radio operator of Californian had stayed at his post an hour longer, hundreds of lives might have been saved. Later, SS Californian’s second Officer Herbert Stone, observed the ship too, judging it to be about 5 miles away. He even tried signaling her with the Morse lamp without success. He also saw five white rockets exploding above the stopped ship. Unsure what the rockets meant, he called Captain Lord, who was resting in the chartroom and reported the sighting. Lord did not act on the report. He asked if the rockets had been a company signal, but Stone did not know. Then he ordered Stone to tell him if anything about the ship changed, to keep signaling it with the Morse lamp, but did not order that it be contacted by wireless. Stone was perturbed: “A ship is not going to fire rockets at sea for nothing,” he told a colleague. 0:51:02 (00:30) – The SS Mount Temple receives Titanic’s distress call and is the first ship to make way for Titanic’s position. On the boat deck, as the crew began preparing the lifeboats, it was difficult to hear anything over the noise of high-pressure steam being vented from the boilers and escaping via the valves on the funnels above. One of the survivors, the English science teacher, journalist, and author Lawrence Beesley (31 December 1877 – 14 February 1967) described the sound as “a harsh, deafening boom that made conversation difficult; if one imagines 20 locomotives blowing off steam in a low key it would give some idea of the unpleasant sound that met us as we climbed out on the top deck.” The noise was so loud that the crew had to use hand signals to communicate. The collapsible lifeboats were stored upside down with the sides folded in and would have to be erected and moved to the davits for launching. Two were stored under the wooden boats and the other two were lashed atop the officers’ quarters. The position of the latter would make them extremely difficult to launch, as they weighed several tons each and had to be manhandled down to the boat deck. 0:56:12 (00:35) – the Fourth officer Joseph Boxhall recalculates Titanic’s position based on the stars. The new position is delivered to the wireless room. But it was a much slower vessel than Titanic and, even driven at her maximum speed of 17 kn (20 mph; 31 km/h), would have taken four hours to reach the sinking ship. Carpathia started steaming through the night at high speed and at considerable risk, as the ship had to dodge numerous icebergs en route. At 00:40, lifeboat No. 7 was rowed away from Titanic. Despite a capacity of 65, there were only 28 passengers on board. Only one lifeboat drill had been conducted while the ship was docked at Southampton. So, as lifeboat training had been minimal, the crew was unprepared for the emergency. The officers did not know how many people they could safely put aboard the lifeboats and launched many of them barely half-full. Furthermore, Titanic’s crew were poorly trained on using the davits (lifeboat launching equipment). As a result, boat launches were slow, improperly executed, and poorly supervised. These factors contributed to the lifeboats departing with only half capacity. The “women and children first” protocol was generally followed when loading the lifeboats, and most of the male passengers and crew were left aboard. Thomas E. Bonsall, a historian of the disaster, has commented that the evacuation was so badly organized that “even if they had the number [of] lifeboats they needed, it is impossible to see how they could have launched them” given the lack of time and poor leadership. Captain Edward John Smith was an experienced seaman who had served for 40 years at sea, including 27 years in command. This was the first crisis of his career, and he would have known that even if all the boats were fully occupied, more than a thousand people would remain on the ship as she went down with little or no chance of survival. As Smith began to grasp the enormity of what was about to happen, he appears to have become paralyzed by indecision. He had ordered passengers and crew to muster, but from that point onward, he failed to order his officers to put the passengers into the lifeboats; he did not adequately organize the crew; he failed to convey crucial information to his officers and crew; he sometimes gave ambiguous or impractical orders and he never gave the command to abandon ship. Even some of his bridge officers were unaware for some time after the collision that the ship was sinking; Fourth Officer Joseph Boxhall did not find out until 01:15, barely an hour before the ship went down, while Quartermaster George Rowe was so unaware of the emergency that after the evacuation had started, he phoned the bridge from his watch station to ask why he had just seen a lifeboat go past. Smith did not inform his officers that the ship did not have enough lifeboats to save everyone. He did not supervise the loading of the lifeboats and seemingly made no effort to find out if his orders were being followed. 1:03:19 (00:42) – the SS Frankfurt responds to the distress calls. 1:04:12 (00:43) – Lifeboat No. 4 is lowered to A-deck for loading. The crew cannot open the A-deck windows, so lifeboat no. 4 sits idly for a while. 1:05:04 (00:44) – Lifeboat No. 5 is launched with 36 people on board. It is the second lifeboat to be launched. 1:05:20 (00:44) – The D-deck gangway doors are opened to assist in loading the lifeboats. They are never used, though. Radio operator Harold Bride suggested to his colleague Jack Phillips that he should use the new SOS signal, as it “may be your last chance to send it”. 1:05:20 (00:44) – The fourth officer Joseph Boxhall launches the first distress rocket in an attempt to signal the ship on the horizon, the “SS Californian”. 1:10:22 (00:49) – The Carpathia confirms that it is on its way. It is 58 miles, or around four hours, from the Titanic. 1:11:02 (00:50) – Steam stops venting from the funnels. 1:11:36 (00:50) – Lifeboat No. 9 is lowered to A-deck by Chief Officer Henry Tingle Wilde. 1:12:16 (00:51) – Second Officer Charles Lightoller officially adopts “women and children ONLY” policy. Lightoller interpreted Captain Smith’s order for “the evacuation of women and children first” as essentially “women and children only”. As a result, Lightoller lowered lifeboats with empty seats if there were no women and children waiting to board, meaning to fill them to capacity once they had reached the water. 1:13:20 (00:52) – The starboard list is eliminated as Boiler Room 5 floods. 1:16:42 (00:55) – Lifeboat No. 3 is launched with 32 people on board. 1:19:08 (00:58) – The orchestra moves to the Grand Staircase landing on the Boat Deck. 1:21:26 (01:00) – Lifeboat No. 8 leaves with 27 people on board. Over the course of the night, it rows over 2 miles away. 1:26:44 (01:05) – Lifeboat No. 1 is launched with only 12 people on board despite it has a capacity of 40. 1:28:22 (01:07) – Suction pumps are assembled and activated in the flooded areas in a desperate attempt to delay the ship’s sinking. 1:31:32 (01:10) – Lifeboat No. 6 is launched with 23 people on board, including the American socialite and philanthropist Margaret Brown (July 18, 1867 – October 26, 1932), posthumously known as “The Unsinkable Molly Brown”. She is best remembered for encouraging the crew in Lifeboat No. 6 to return to the debris field of Titanic after the sinking of the ship to look for survivors. Accounts, though, differ on whether the boat actually returned to look for survivors, and if so, whether any survivors were found. 1:35:40 (01:14) – Lifeboat No. 6 stops lowering after it is realized that there aren’t enough sailors on board. First Class passenger Arthur Peuchen volunteers to go, as he is a yachtsman, a member of the Royal Canadian Yacht Club. He is the only adult male passenger allowed into a boat by Second Officer Charles Lightoller. 1:36:57 (01:15) – Water is up to Titanic’s nameplate. 1:39:38 (01:18) – Titanic begins listing to port. By 01:20, the seriousness of the situation was now apparent to the passengers above decks, who began saying their goodbyes, with husbands escorting their wives and children to the lifeboats. 1:41:34 (01:20) – Lifeboat No. 16 is launched with 53 people on board. 1:43:11 (01:22) – Boiler Room 4 is forced to be abandoned. 1:44:05 (01:23) – Titanic lists increasingly to port. 1:46:55 (01:25) – Lifeboat No. 14 is launched with 40 people on board. 1:47:19 (01:26) – Fifth Officer Harold Lowe fires his pistol to scare off a mob of men threatening to jump into Lifeboard No. 14 as it passes the A-Deck Promenade. 1:47:48 (01:26) – RMS Baltic confirms it is coming. 1:49:10 (01:28) – SS Frankfurt confirms it is coming. Another to respond was SS Mount Temple, which set a course and headed for Titanic’s position but was stopped en-route by pack ice. 1:51:03 (01:29) – Revolvers are issued to Titanic’s officers. 1:51:15 (01:30) – Lifeboat No. 14 is dropped four feet (1.2 meters) into the sea from its falls after they jammed. 1:51:42 (01:30) – Lifeboat No. 12 is launched with 42 people on board. Titanic’s down angle altered fairly rapidly from zero degrees to about 4.5° degrees during the first hour after the collision, but the rate at which the ship went down slowed greatly for the second hour, worsening only to about 5°. This gave many of those aboard a false sense of hope that the ship might stay afloat long enough for them to be rescued. By 1:30, the sinking rate of the front section increased until Titanic reached a down angle of about 10°. 1:52:08 (01:31) – Second Officer Charles Lightoller orders men out of Lifeboat No. 2 at gunpoint. 1:52:30 (01:31) – Lifeboat No. 9 is launched with 40 people on board. 1:53:32 (01:32) – The RMS Virginian confirms they are coming. 1:54:21 (01:33) – Titanic is in communication with about a dozen ships. 1:55:31 (01:34) – Sailors link arms to hold back riotous passengers from Lifeboat No. 2. At this point, the vast majority of passengers who had boarded lifeboats were from first- and second-class. Few third-class (steerage) passengers had made it up onto the deck, and most were still lost in the maze of corridors or trapped behind barriers and partitions that segregated the accommodation for the steerage passengers from the first- and second-class areas. This segregation was not simply for social reasons but was a requirement of United States immigration laws, which mandated that third-class passengers be segregated to control immigration and to prevent the spread of infectious diseases. First- and second-class passengers on transatlantic liners disembarked at the main piers on Manhattan Island, but steerage passengers had to go through health checks and processing at Ellis Island. 1:56:24 (01:35) – Water begins discharging through the condensers. 1:58:27 (01:37) – Titanic’s power decreases. Cape Race and Canada are now out of range of the telegraph. 1:58:53 (01:37) – Lifeboat No. 11 is launched with 50 people on board. The remaining boats were filled much closer to capacity and in an increasing rush. No. 11 was filled with five people more than its rated capacity. Lifeboat No. 13 is launched with 55 people on board. 2:02:41 (01:41) – As Lifeboat No. 11 was lowered, it was nearly flooded by water being pumped out of the ship. 2:04:24 (01:43) – The orchestra briefly disbands to retrieve their lifebelts. 2:05:21 (01:44) – Lifeboat No. 13 is abruptly pushed aft by the force of the bilge discharge, jamming it on the falls. 2:05:48 (01:44) – Lifeboat No. 15 is launched with 68 people on board. The deteriorating situation was reflected in the tone of the messages sent from the ship: “We are putting the women off in the boats” at 01:25, “Engine room getting flooded” at 01:35, and at 01:45, “Engine room full up to boilers.” This was Titanic’s last intelligible signal, sent as the ship’s electrical system began to fail; subsequent messages were jumbled and broken. The two radio operators nonetheless continued sending out distress messages almost to the very end. 2:06:44 (01:45) – Lifeboat No. 13 cannot release itself as Lifeboat No. 15 comes down on top of it. 2:07:05 (01:45) – Lifeboat No. 13 is released and pulls out from under Lifeboat No. 15 as the latter lands in the water. 2:07:38 (01:46) – Lifeboat No. 2 is launched with 17 people on board. 2:08:06 (01:46) – A first-class passenger, the industrialist Benjamin Guggenheim and his manservant emerged from their cabins dressed in tuxedos. He gives his final words “we have dressed in our best and are prepared to go down like gentlemen”. 2:08:34 (01:47) – The SS Frankfurt expresses confusion about the situation and may not be coming after all. 2:09:31 (01:48) – The lights on the horizon (the lights of the SS Californian) disappear. 2:10:20 (01:49) – The RMS Olympic, Titanic’s sister ship, confirms that they are coming. She is around 500 miles away, however. 2:10:51 (01:49) – The orchestra reassembles on the Boat Deck outside the Grand Staircase. 2:11:34 (01:50) – Titanic’s power decreases. Olympic and Mount Temple are now out of range of the telegraph. 2:11:51 (01:50) – Lifeboat No. 4 is launched with 30 people on board. 2:12:20 (01:51) – Lifeboat No. 10 is launched with 57 people on board. 2:16:11 (01:54) – Lifeboat No. 4 rows for the open gangway door, but cannot find it as it is already underwater. 2:16:53 (01:55) – Titanic’s power decreases. The Carpathia is now out of range of the telegraph. 2:17:35 (01:56) – Captain Smith gives two telegraph operators, Jack Phillips, and Harold Bride, permission to abandon their post and save themselves. They choose to stay longer, despite transmissions failing. 2:18:04 (01:56) – Second Officer Charles Lightoller fires his gun into the air to keep passengers from swarming Collapsible Boat D, now being loaded. 2:20:15 (01:59) – Titanic’s builder Thomas Andrews, Captain Edward J. Smith, and Chief Officer Henry Wilde make a desperate attempt using the Captain’s megaphone to call back the half-full lifeboats to the ship to pick up more passengers. 2:20:46 (01:59) – J. Bruce Ismay, the chairman of the White Star Line and the owner of the Titanic, who had been desperately encouraging passengers to escape the whole night, is ordered into Collapsible Boat C by First Officer William Murdoch. 2:21:10 (02:00) – It is now 2:00 AM. Titanic has 20 minutes left. 2:21:54 (02:00) – Collapsible C is launched with 43 people on board. It scrapes the side of the ship the whole way down. 2:23:14 (02:02) – The crew begins working on the final two collapsible boats on the roof of the Officer’s Quarters. 2:24:20 (02:03) – Titanic’s power decreases. Its telegraph no longer functions. 2:28:15 (02:07) – Andrews, Smith, and Wilde abandon their hopes to call the lifeboats back to the Titanic. 2:29:38 (02:08) – Last messages are heard from the Titanic. They are unintelligible. 2:30:46 (02:09) – Collapsible A is slid off the roof on ramps made of lifeboat oars. 2:31:04 (02:09) – The Wireless Room is abandoned. 2:31:22 (02:10) – Collapsible A is loaded on the deck before it is even ready to launch. 2:32:29 (02:11) – Collapsible B thrown from the roof of the Officer’s quarters. It lands upside down in the water on top of junior telegraphist Harald Bride (11 January 1890 – 29 April 1956). Bride, Second Officer Charles Lightoller and Colonel Archibald Gracie made it onto Collapsible B, but First Officer William Murdoch and Chief Officer Henry Wilde perished in the water. 2:34:00 (02:12) – Survivors distinctly hear four explosions from deep within the ship as her plunge begins. 2:39:05 (02:17) – There are about 1,500 people still on board. 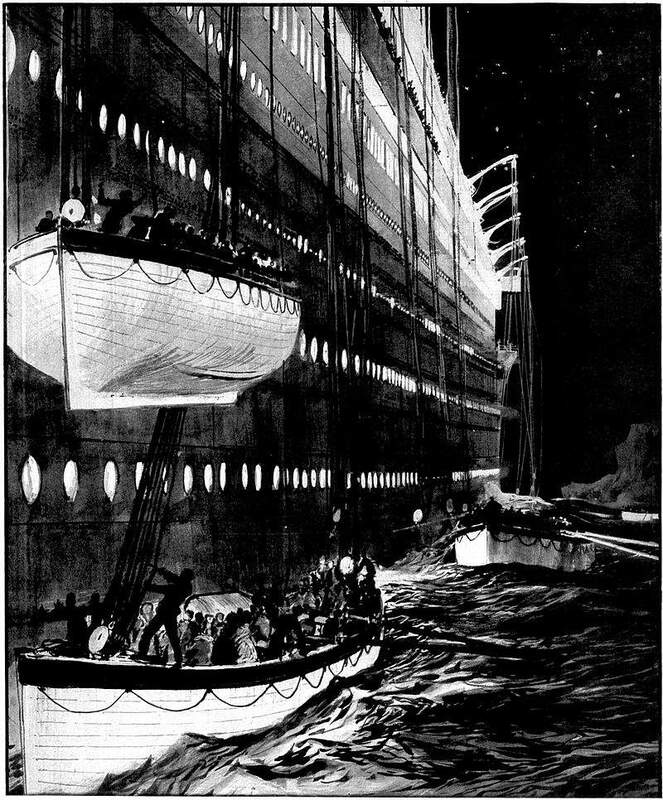 2:39:25 (02:18) – The lights of the ship are gone. Shortly after the lights went out, the ship split apart. The submerged bow may have remained attached to the stern by the keel for a short time, pulling the stern to a high angle before separating and leaving the stern to float for a few minutes longer. The forward part of the stern would have flooded very rapidly, causing it to tilt and then settle briefly until sinking. For many years it was generally believed the ship sank in one piece; however, when the wreck was located many years later, it was discovered that the ship had fully broken in two. It was so dark out, apparently, most people didn’t even know the ship broke into two, including a lot of people who were there when it happened, until they found the wreckage in 1985. Titanic’s surviving officers and some prominent survivors testified that the ship had sunk in one piece, a belief that was affirmed by the British and American inquiries into the disaster. The few who did see it was called liars by the ship’s owners. They claimed the ship splitting was “impossible”. The ship disappeared from view at 02:20, 2 hours and 40 minutes after striking the iceberg. Rescue does not arrive for another hour and forty minutes. 2:40:50 (02:21) – Titanic is heard beneath the surface breaking apart and imploding as it falls to the sea floor. In the immediate aftermath of the sinking, hundreds of passengers and crew were left dying in the icy sea, surrounded by debris from the ship. Titanic’s disintegration during her descent to the seabed caused buoyant chunks of debris – timber beams, wooden doors, furniture, paneling and chunks of cork from the bulkheads – to rocket to the surface. These injured and possibly killed some of the swimmers; others used the debris to try to keep themselves afloat. With a temperature of 28 °F (-2 °C), the seawater was lethally cold. Second Officer Lightoller described the feeling of “a thousand knives” being driven into his body as he entered the sea. Sudden immersion into freezing water typically causes death within minutes, either from cardiac arrest, uncontrollable breathing of water, or cold incapacitation (not, as commonly believed, from hypothermia); almost all of those in the water died of cardiac arrest or other bodily reactions to freezing water within 15–30 minutes. Only 13 of them were helped into the lifeboats even though these had room for almost 500 more people. After about twenty minutes, the cries began to fade as the swimmers lapsed into unconsciousness and death. Titanic’s survivors were rescued around 04:00 on 15 April by the RMS Carpathia, which had steamed through the night at high speed and at considerable risk, as the ship had to dodge numerous icebergs en route. Carpathia’s lights were first spotted around 03:30, which greatly cheered the survivors, though it took several more hours for everyone to be brought aboard. The death toll of the disaster has been put at between 1,490 and 1,635 people.